As a Tech Smart Boss, we’re jacks of all trades when it comes to technology, but that doesn’t mean we know a dog gone thing when it comes to designing graphics. And having really good brand graphics to help improve the credibility of your business is important. So if you are graphically challenged (like I am), you have 2 options. You can pay someone to create your graphics or you can find easy software to do it yourself. I actually recommend you do both, have someone create you some really eye catching graphics and then use tools like Canva and Stencil to re-purpose them into all your blog headers, social media graphics, eBook covers, and more. 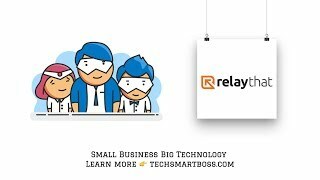 But in this video, I cover a new product to add to your graphic tech stack, RelayThat. RelayThat will take all your brand assets, logos, mascots, screenshots, pictures, whatever images you have and allow you to instantly create 100’s of high quality graphics, in a variety of styles and sizes, that you can instantly download and use. I don’t think there is an easier or faster way to create a cohesive brand library of graphics. In this video, I create a new account, load up some of my assets, and give it a walk through. Check it out and leave us a comment on what you think about this video and RelayThat.